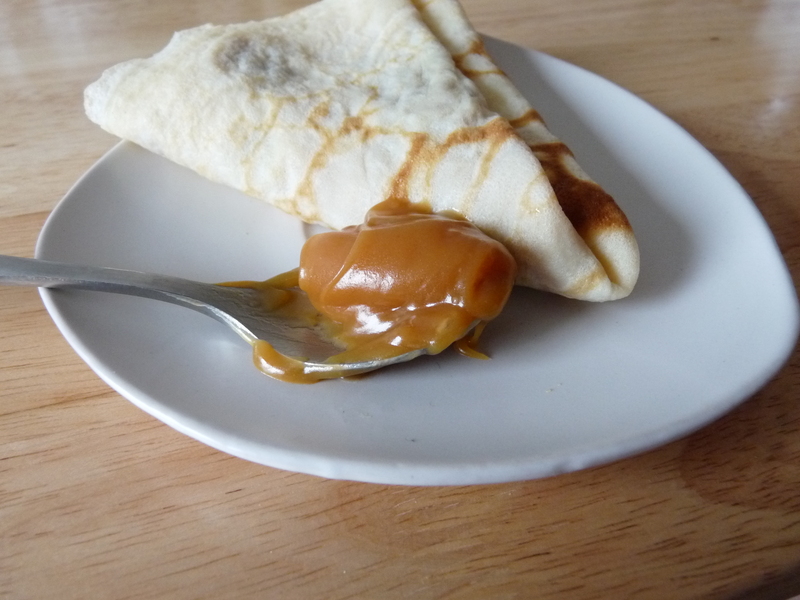 How to make crêpes au caramel beurre salé like in Brittany? I come from Brittany in France and we are proud of our region et its culture. Crêpes (thin pancakes) are an institution there and if we can spread some caramel beurre sale (salted caramel) on it then it is heaven! I am happy to share with you these two traditional recipes. How to make the crêpes? Normally we use a special pan which is flat to make the crepes. In a bowl, stir together the flour and the milk with a wooden spoon (you will have muscular arms! Then add the milk gradually and the rum. Let the batter rest for at least 1 hour. Then stir the rested batter and we can begin the crepe party. Pour one ladle full of batter in the pan which has been previously greased. Once the borders of the crepe unsticked the pan, Turn the crepe on the other side. Normally we make the crepe jumped to turn it over but you can use a spatula. Now that we have the crepes we need to do the caramel. How to make the caramel au beurre salé (milky caramel made of salted butter)? In a saucepan let your sugar melted. Once the caramel is getting brown, add the single cream but keep stiring slowly. Then add the butter and keep stiring until it is well melted. Pour the caramel beurre salé in the pot and let it cool down. Now that you have the crepes and the caramel, just enjoy them with a pint of cider!